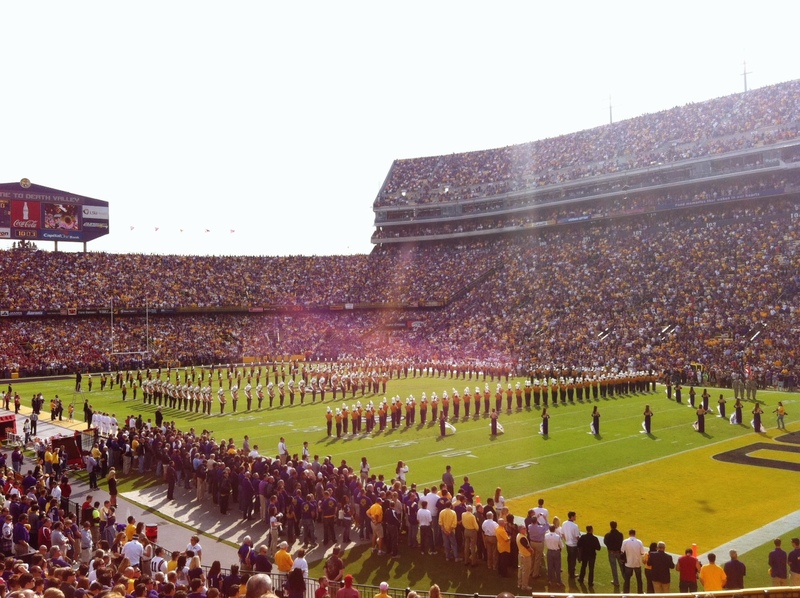 Ah, Death Valley, it was great to be back. We hadn’t hung out since the LSU-Auburn game in 2009. That one was a blowout and thankfully, so was yesterday’s game against those pesky Razorbacks from Arkansas. I have to admit, coming into this game, I was a little nervous about the possibility of an upset. But these Tigers just seem to be on a different level than any other team in the nation. I had forgotten how bad the traffic in Baton Rouge can get so I did not enjoy the one-hour trip turning into a two-hour trip. That was all forgotten once I was tailgating with the Tigalaya.com crew on the pristine LSU campus. I didn’t have long to tailgate. Two strong bloody marys and it was time to head to the stadium. Fellow blogger Dat Tiger Fan hooked me up with a great ticket in Section 221. If you check his blog, you’ll figure out this guy know his football. His prediction for the LSU-Arkansas game? 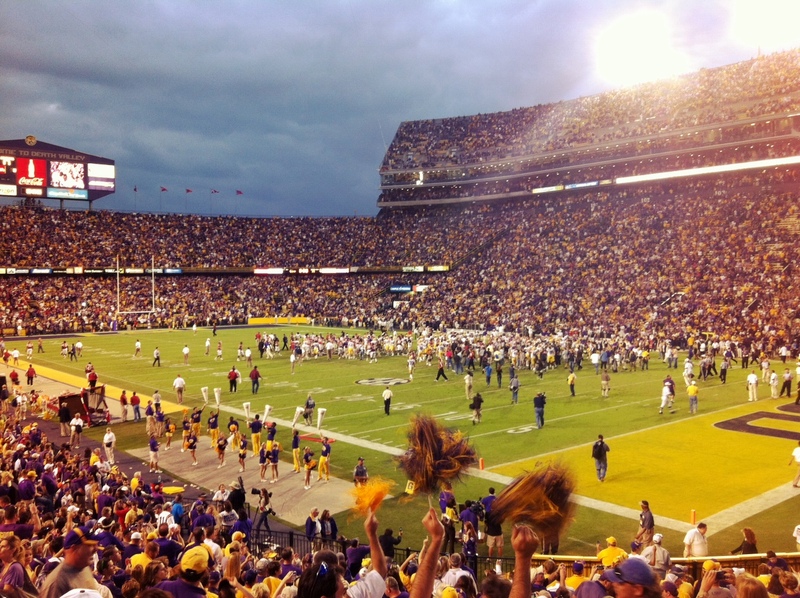 A 38-17 LSU victory. He was only off by a field goal. It was great to be back on the scene taking in the atmosphere of Tiger Stadium, doing the LSU cheers and listening to The Golden Band from Tigerland. Once the game started, Arkansas got out to a 14-0 lead and had me thinking my fear of an upset might become a reality. But the Tigers didn’t panic, didn’t hang their heads and got their acts together and took off on a 41-3 run to clinch a spot in Atlanta in the SEC Championship. And more than likely, a spot in the Mercedes-Benz Superdome on Jan. 9 for a chance to play for another BCS Championship. A lot of people are expecting the championship game to be a rematch of the LSU-Alabama game. 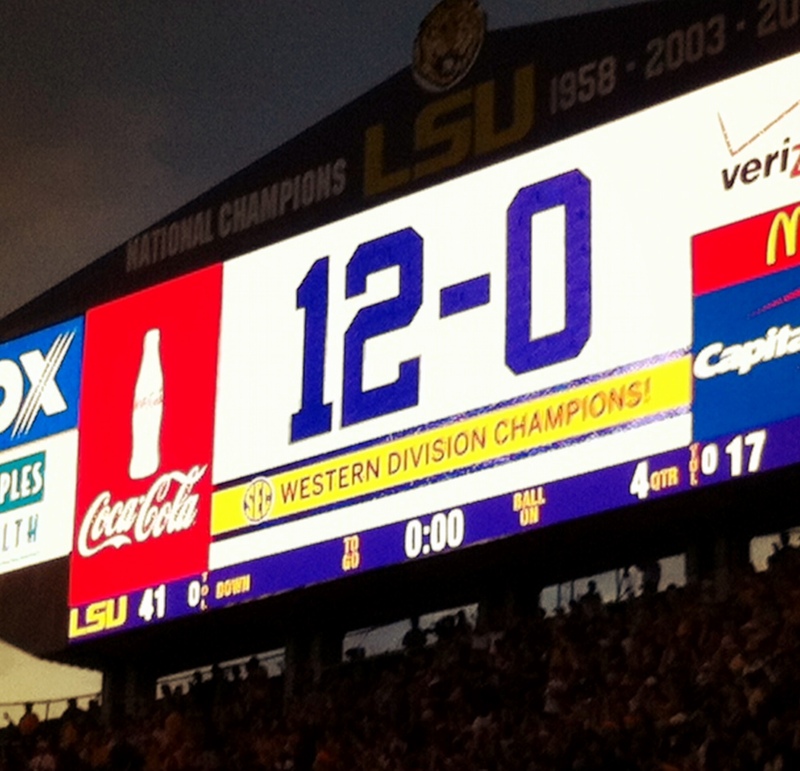 While I do agree LSU and Alabama are the two best teams out there, I don’t think a rematch is fair. Alabama failed to win it’s division, conference and its home game against LSU. The Crimson Tide had their chance and couldn’t seal the deal while LSU passed every test put in front of it. Why should Alabama be rewarded with an extra week off while LSU is forced to play the Georgia Bulldogs for the SEC Championship? A game that will be another Top 25 matchup for LSU. That’s eight games against Top 25 foes for those of you keeping score at home. How many Top 25 teams has Alabama faced? Five. Yet another reason Alabama is undeserving of a rematch.